about how to handle criticism in your life. If you’ve ever had somebody criticize you or “bash” you behind your back…or embarrass you in front of others, then you know how hurtful criticism can be. knew me — now know who I am. So now that I’m finally achieving some type of success, the “haters” are starting to come out and bash me. At first I took it personal. But after listening to Bedros reveal his powerful lesson about the Eagle and the “Mangy” Crow, it totally changed my attitude and perspective on criticism. So please pay close attention. This one is short and sweet, but it’s a game-changer. The Eagle’s #1 enemy is the Mangy Crow. 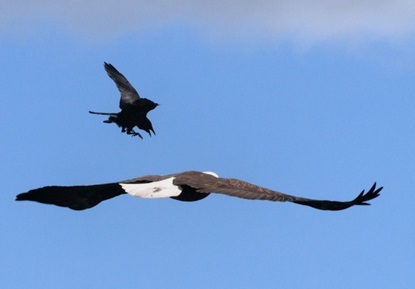 In fact, 3 Mangy Crows will gang up on the mighty Eagle and attack him from behind. Instead of fighting back, the Eagle simply flies higher and higher until it reaches an elevation where the crows can no longer fly. In other words, the Eagle “rises above” his enemy. This is probably the best example in the world about how to deal with people who criticize you or try to bring you down. If you look behind, all you’ll see is the Mangy Crow pecking at your tail while they drag you down to their level. This will consume your time, your energy, and take you backwards in life. But if you look ahead and soar higher than your enemies, like the mighty Eagle, the pesky and negative Mangy Crows will have no choice but to go find another Eagle to attack. And since every single one of us will deal with enemies and haters at some point during our lives, this is some of the best advice you can get. HATERS is just an acronym for Having Anger Towards Everyone Reaching Success. Love it Vince. So true. What about you? 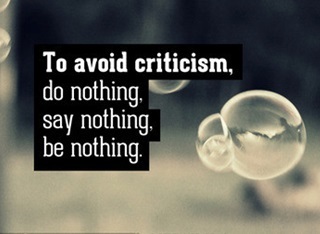 Have you ever been under attack or criticized? If so, how did you handle the criticism? I’m curious to know your thoughts about this powerful lesson. Please leave me a comment. Remember, your feedback is important to us. That’s why my wife reads every response and shares them with me. Please share or “like” us.